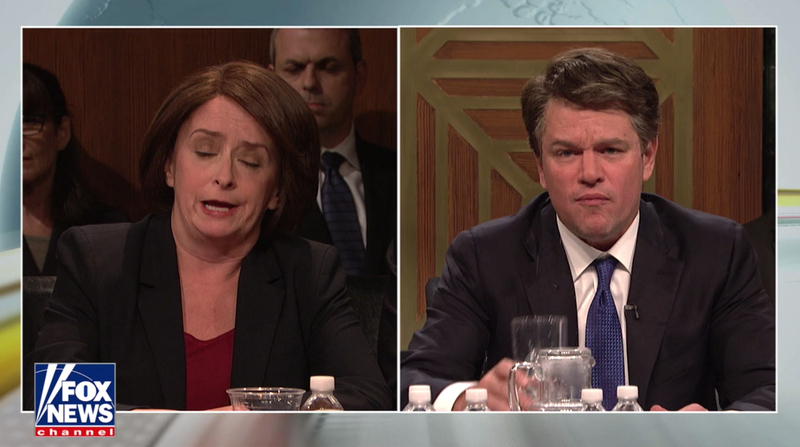 As part of the now viral “Saturday Night Live” cold open from Saturday, Sept. 29, 2018, the show poked fun at Fox News‘ coverage of Brett Kavanaugh’s testimony before a senate committee earlier in the week. The sketch kicked off with the network’s familiar “Fox News Alert” animation — though generic production music was dubbed over the familiar “bell tone” sound effect. After that, “SNL” featured Leslie Jones as Fox News host Harris Faulker, who normally hosted “Outnumbered” and “Outnumbered Overtime” introducing what coverage that, at least according to the faux Faulker, the network was branding as “Wuh oh!” — complete with recreated Fox News lower third with the words. 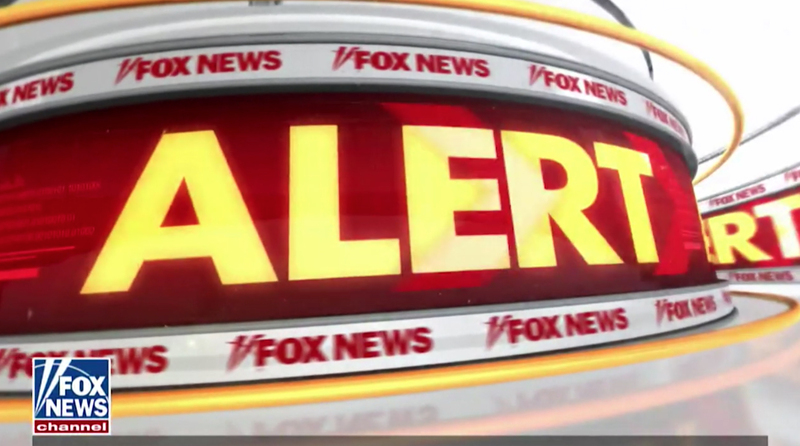 Although NBC opted to use what appeared to be a Fox News Alert animation taken directly from the network’s air (evidenced by the correct bug and dark gray bar near the bottom), the logo and lower third used elsewhere during the sketch appear to have been built from scratch to mimic the look. There are slight differences in the design — namely the position of the “gel” effect, typography and some of the colors are slightly different. The border thicknesses throughout were also slightly narrower. Jones introduced the coverage from in front of orange gold and silver rings that channel the “Overtime” look — though it’s worth noting Faulker’s show did not air Thursday, Sept. 27, 2018, due to the coverage nor was she part of the panel providing special coverage. NBC also borrowed the “Overtime” look for behind its split screen boxes, though Fox used Supreme Court themed graphics instead of show branded graphics. The actual boxed design Fox used during the Kavanaugh hearing. 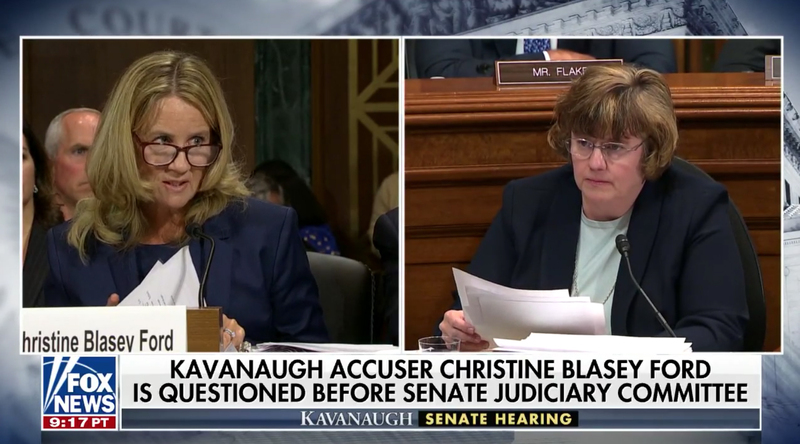 It’s also worth noting that had NBC’s version of Fox actually been branding the coverage under “Wuh Oh!,” a matching graphic probably should have been used in the “sliver” space below the lower thirds instead of the much more boring “Kavanaugh Senate Hearing” text. 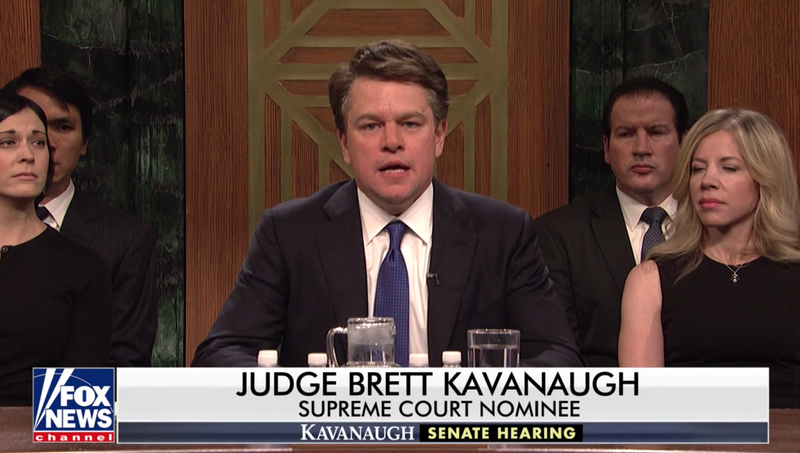 NBC also got the typography close to matching Fox News’ actual look — though it wasn’t quite a bold in most cases, such as this lower third identifying Matt Damon as Brett Kavanaugh.